This grille, which owes some influence to Continental Art Nouveau, was installed above one of the lift entrances in stations built to the design of Leslie W. Green in 1906-7 for the Underground Electric Railways Company on what are now the Bakerloo, Piccadilly and Northern Lines. It was removed in the early 1980s, when all central London Underground stations underwent refurbishment. 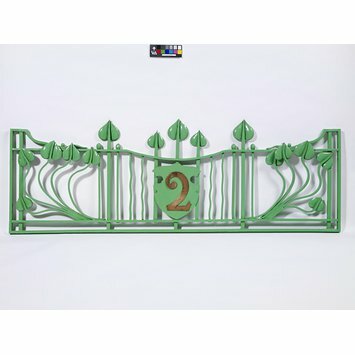 No record was made which particular station this grille came from nor who manufactured it but it may well have been the Birmingham Guild of Handicraft Ltd.
Headpiece from a lift grille, painted wrought iron. Art Nouveau stylised plant patterns of curving stems and leaves. The grille is rectangular with square ends, the top left and right hand corners extend inwards for a short distance and then curve downwards to the top rail which is straight except for a concave dip in the centre. The grille is braced by top rails inset along the lower edge and sides. The centre is filled with a series of straight and wriggle work uprights. At either end of this centre section, two straight uprights protrude through the top rail and are capped by an ovoid finial. Between them, a straight upright, square in cross section, pierces the top rail and rises to a stylised tulip finial. This is repeated in the centre with a group of three uprights, the centre one taller than the other two, immediately flanking either side. A shield in the centre of this composition is supported by these uprights and bears the serified numeral 2, cut from sheet copper and applied to the front. At either end of the panel is a group of five freely wrought square section rods, gathered together at the lower cross rail, four which curve upwards and then return inwards near the top, the bottom snakes across to the side upright and all terminate with stylised, tulip heads. Barbara Tilson, ed. Made in Birmingham, Design and Industry 1889-1989, Birmingham, Brewin Books, 1989, pp.65-66.